This 4,900 square-foot home, listed by Slifer, Smith and Frampton, sold for $2.45 million. Located in the Highlands at Breckenridge Gold Run subdivision, the home rests just at the edge of the golf course. Real estate values continued to climb through the end of 2015, with increases across the board for all types of properties. With a busy holiday season, December brought a strong end to the year, with increased sales across the county. According to 17 months of data gathered by the Summit County Assessor’s Office, the value of townhome sales increased 24 percent, and single-family homes were up 17 percent. While last year brought in just over $1.06 billion in sales, 2015 saw more than $1.37 billion in real estate transactions. The month of December brought in a decent chunk of those sales, netting $93.3 million for the month. Of all the properties, transactions in the Breckenridge area brought in the most dollars for December. The top sale was a half-acre plot of land in the Timber Trail subdivision, valued at $2.48 million. 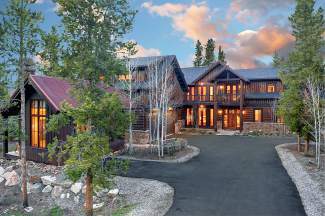 Another top-seller was a home located in the Highlands at Breckenridge Gold Run, which sold for $2.45 million. The 4,900-square-foot house has six-bedroom and six-bathrooms, located on a plot of forested land at the edge of the golf course. November also saw a few notable sales, one tipping the charts at just below $4 million. The 46.5 acre-parcel of land, located east of Breckenridge near Ford Gulch, features a 6,400-square-foot log home surrounded by open space, with views of the valley below. According to the assessment, the home also features a swimming pool, guest apartment, home theater and a three-car garage. It was constructed in 2001. Breakstone said the $3.9 million sale was unusually high for November. With 12 sales exceeding $1 million in December, sales in Summit were strong this winter.